I am raising as a working mother. This is, however, not happened to me while growing up in a direct sense. My mother was a housewife which means she didn’t leave the house every single day but she was busy with other things within the abode. We had a joint family of more than twenty members back then. Maa along with my Jethima, Boudi etc was responsible for managing every single thing and their schedules were as demanding as mine now. Be it the monthly planning; be it the budget or be it managing the clan of the not-so-understanding clan of us. They raised us well and without Chocolate Cupcake with Chocolate Buttercream Frosting but with Mangshor Jhol. I always believe I learned my first lesson of management from my family. I just have returned from an official trip covering the weekend. My official travels are not typical and restricted to the weekdays and as a matter of fact, I do enjoy what I do for a living. I always loved the sector for which I work. Most importantly Pasta is absolutely okay with the arrangement. She never complains, for that matter. I know this is big on her part considering her age. Every time I travel without her I make sure to make a treat for her. This is kind of my way of thanking my ever understanding five-years-old. 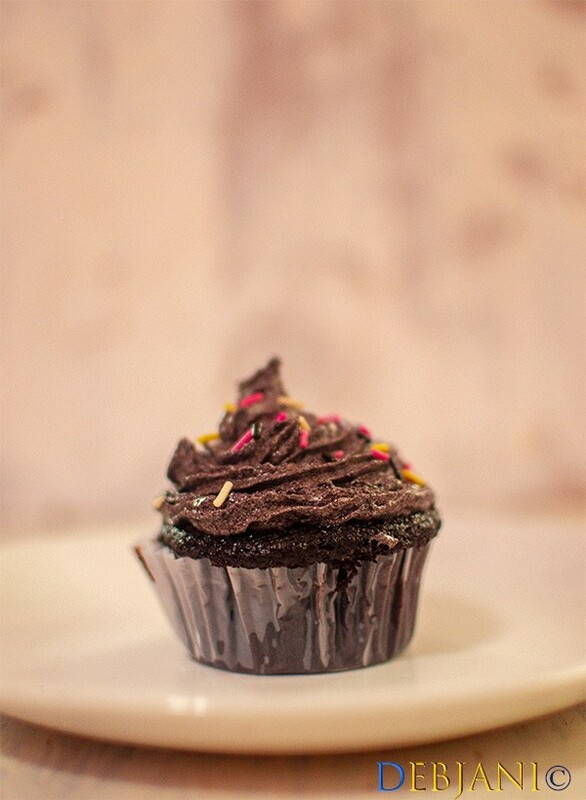 This time it is Chocolate Cupcake with Chocolate Buttercream Frosting. Ours is a nuclear family; just with Mehebub, Me and Pasta. Parents from both the side visit us often. While in our part, we visit them less. The minimum we did for them is we shifted our base to the nearest city possible. It was a tough decision on both my and Mehebub’s part a few years back. We both decided to ignore the monitory gain which would have had if we were not in Kolkata but this was the least we could do for the family and for Pasta. We both are busy with our professional and social commitments and Pasta needs quality time from the family. Our parents also deserved to be with their granddaughter and hence this decision. Looking back I realize what we did; we did for good. Coming back to the Chocolate Cupcake with Chocolate Buttercream Frosting type of parenting; we both have a very casual approach of raising Pasta. We don’t pressure her to study. She knows about her Momma’s and Papa’s lifestyle and never complains. She also knows the little time we spent together is quality time. Every single night she waits for us to have the dinner with us or if not the dinner one round of light music with our favorite drinks. Her’s is non-alcoholic needless to say 😛 . 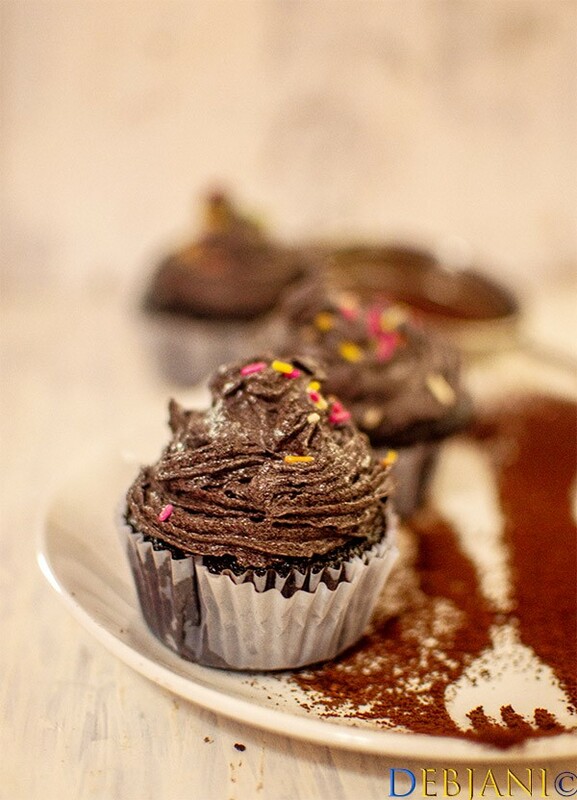 Here’s how I bake and make Chocolate Cupcake with Chocolate Buttercream Frosting at Debjanir Rannaghar! Take All-purpose flour along with Cocoa Powder, Baking Powder, Baking Soda and also Salt in a bowl and mix. Now shift the mixture three times using a sieve. Take Oil along with both types of sugar in a bowl and using a blender blend until smooth. Add Buttermilk and mix that too. Now add Eggs in room temperature and blend lightly to get a frothy mixture. Now add the flour mixture in three batches to the wet mixture and mix using the cut and fold method to get a smooth cake batter. 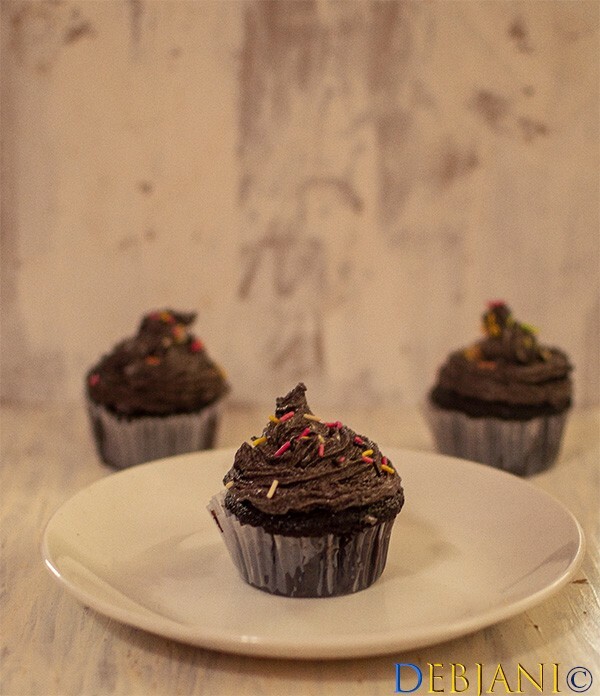 Pre-heat the oven in 180 degrees C.
Line cupcake tin with liners and fill each liner ⅔ with the batter. Bake in 180 degrees C for 20 minutes. check the cakes after 15 minutes of baking by inserting a toothpick in the middle. Once done take the tin out of the oven and cool over a wire rack. 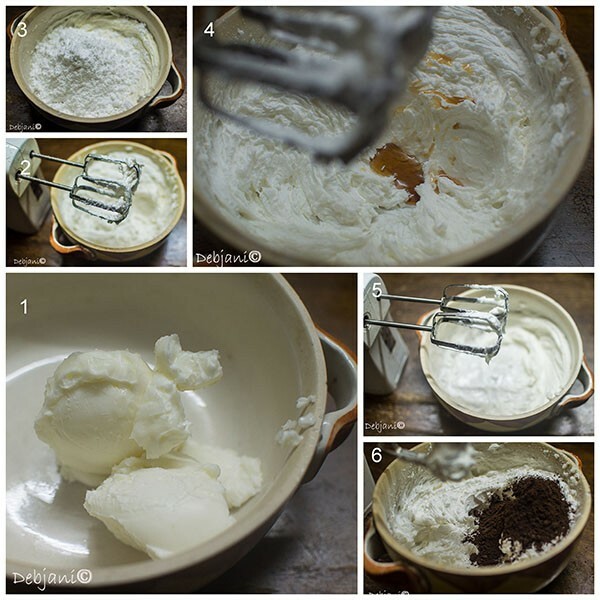 Take the butter in room temperature and blend using an electric blender on medium speed until smooth. Now add Sugar in small batches and blend until smooth buttercream formed. 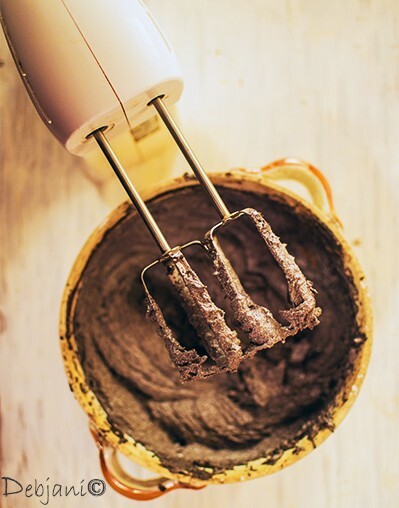 Add cocoa powder and also both the essence and mix to complete the Chocolate Buttercream Frosting. Fill a liner with the buttercream and top the cupcakes with the buttercream. Baking time varies oven to oven. 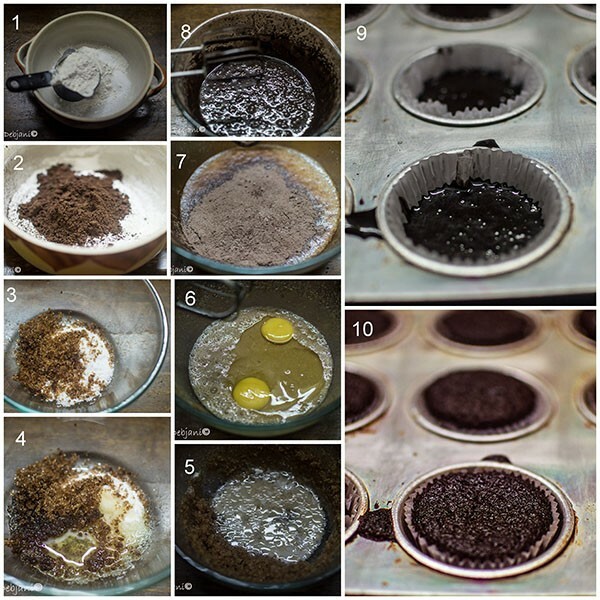 Check the cakes after 15 minutes of baking. You can replace the brown sugar with granulated sugar and vice versa. You can use butter or half and half instead of Oil. Baked goodies from Debjanir Rannaghar! 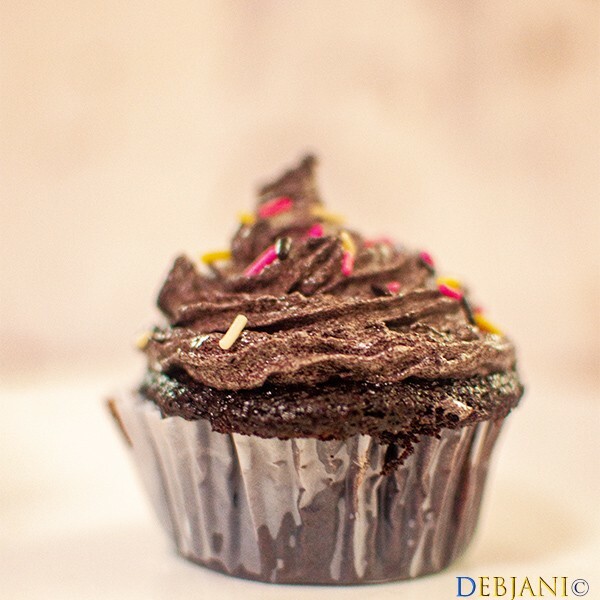 Have you tried the Chocolate Cupcake with Chocolate Buttercream Frosting recipe from Debjanir Rannaghar! « Pinterest for Food Bloggers! Is it worth using Pinterest to increase Food blog Traffic?